10 years ago today, Kim’s original Idina site became Idina-Here. Happy Anniversary! It’s been a long road, with so many people involved to make the site what it is today. Read more about the site’s history. To celebrate, we’ve been hard at work to bring you a full site redesign/revamp. Many pages have been updated, some new ones created, as well as new site sections to enjoy. Today we bring you the first part of this big revamp, which includes the main site as you see it, the newly organized gallery with its new look, and the first new section: the Quotes&Trivia Archive. All the quotes and facts you’ve been sending are there, plus a few more. Thanks everyone who helped us build the archive, and make sure to keep sending quotes and facts! Stay tuned, we still have the redesigned Press Archive and the new Media Site to reveal in upcoming weeks! Thanks everyone for staying with us through the years, and here’s to many more Idina moments to share! New Layout + Welcome Heather! We have a new temporary layout at Idina-Here! Some things don’t look pretty, but a change was necessary. The main site is now 100% mobile friendly. New design will come soon, apologies for any weird formatting happening until then. Annnd, you’ve all probably noticed already since this happened over a month ago, we have a new webmaster! Her name is Heather, has been a fan for several years and we’re very happy to have her on board. She has been doing a great job all around the site and social networks for a while, I just didn’t want to leave her without a proper welcome. Just one day til Frozen Fever! Make sure to see it before Cinderella in theatres tomorrow. Are you seeing Frozen Fever? Share your thoughts below! Ok, I think I’ll have to got a bit further back than just a week! Sorry I’m MIA, I was supposed to be on vacation and working on some cool things around the site but I’m not yet, so posting is a bit slow these days. Let’s catch up! As you all know Idina presented along with John Travolta (here he is at Jimmy Kimmel talking about Adele Dazeem and Idina’s chin) at the Oscars last week (this way for video) and she looked amazing while doing so! Simon G. Jewelry was very kind to send us some pictures of Idina and the pieces she was wearing that night. Gallery updates are coming soon, promise. + Remember Idina’s upcoming guest role in Arthur? 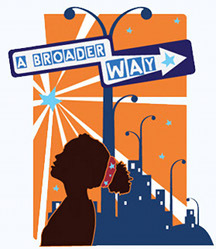 We have an air date for her episode: Shelter from the Storm: Part 1 and Part 2 will air on May 12 on PBS. + Frozen Fever‘s trailer was released this week. Frozen Fever is a short film/Frozen sequel coming to theaters along with with Cinderella on March 13th. In it, Elsa and Kristoff are preparing a birthday celebration for Anna but Elsa gets a cold, which causes her powers to “wreak a little havoc”. + Do you wanna build a snowman? 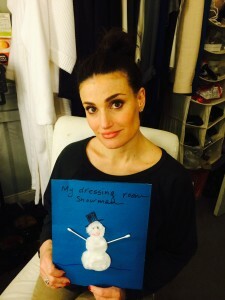 ABroaderWay is having a snowman challenge to raise funds and have some fun, and you could win two tickets to one of Idina’s upcoming concerts with exclusive access to the pre-show sound check while at it. More info here. Did I miss anything? Leave a comment and I will add you to the post!